I’ve just setup a production DSM-750 Medialounge Media Center Extender. 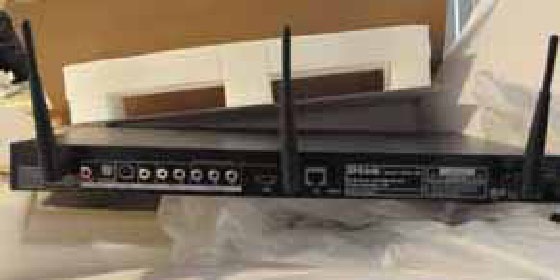 This new extender streams everything over Wireless 802.11n Draft 2.0 (using a DGL-4500 in 5GHz mode) including High Definition Live and Recorded TV from a Vista Ultimate x64 box with two DCT (OCUR) tuners. Some unboxing and setup images can be found at one of my websites. Out of the box, the DSM-750 blows the dinky Linksys DMA 2100 out of the water. Solid construction and a nice looking peripheral that doesn’t look like cheap plastic in my living room. The DMA 2100 has no optical SPDIF (RCA flavor digital SPDIF only) and worse, does not see Atheros based 802.11 Draft 2.0 N SSID’s and probably some other brands. The DMA 2100 only has two antennae. D-Link has all the ports and three antennae, which really helps with wireless connectivity . D-Link integrates network setup with Extender setup and it is a real easy task to get up and running. While I admit to having had experience with a beta engineering sample, the engineering sample was wired only without the 802.11n dual band capability. I was really impressed with how well it worked and how integrated it was. D-Link has tons of experience with something like 6-7 previous versions in the Medialounge wireless media player line. This experience shows. The Linksys takes forever to connect to the host Vista machine while the D-Link connects seamlessly and far more rapidly. In my opinion, if you have a choice between the Linksys DMA 2100 and the D-Link DSM-750, the D-Link is well worth the wait. Linksys was first to market, but the race is not always to the swiftest.